Seems to me when you talk about shocks they appear to come in waves. A bit like their planetary namesakes the Earthquakes/shocks, which apparently number somewhere a round 500,000 per year! Well obviously not in the same league here, but it would appear to me that Casio G-Shock models change and evolve just about weekly. New versions and new technology every time and somewhat expensive if you have to have the latest thing and I’ve known a few collectors in my time who did just that! 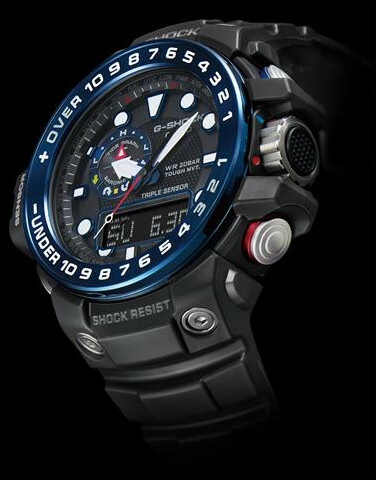 Anyway here’s one I’ve just spotted – the G-Shock Gulfmaster Triple Sensor Black/Blue . . .
And I like this one as it seems to not only add a few wrinkles but has improved the night capability lighting and comes now with the addition to the usual ABC sensors, a Tide Graph and Moon complication. It also uses the newish “smart Access” crown switching system which apparently makes it easier to use – and that has to be a good thing. Solar Tough, so no battery issues, Radio Controlled with 6 Receivers and that Double LED lighting system in a case where the dimensions are not too bad for once. Full LED double light system – much better at night. 44.9mm wide, 55.8 lug to lug and maybe still a bit thick at 16.2mm – but it looks smaller. I particularly like the analog time functions with decent solid hands, large hour markers and the numerical bezel, which incidentally make it look more like a conventional watch than most G-Shock models – and I like that. It also manages a reasonably uncluttered dial and that’s also good. 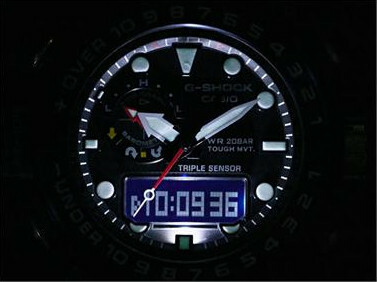 See what I mean about the night clarity – looks much better if this image is anything to go by and not before time in my opinion from Casio. Price point is around $500 or less if you can get one so relatively light on the pocket and it’s still a light weight wrist item too at just 101 gms. So all in all I have to say I’m impressed. But what to do with all my existing ones is a problem, which I have to say is an issue I’ve never had with my Patek Philippe! So maybe I’ll just watch and wait for the next one as there bound to be another shock tomorrow!